‘The Holy Family’: this name is given to the infant Jesus, his mother Mary, her husband Joseph, her mother Anne and her cousin Elizabeth. Paintings of the Holy Family became particularly popular during the Renaissance, as a model of the ideal family. 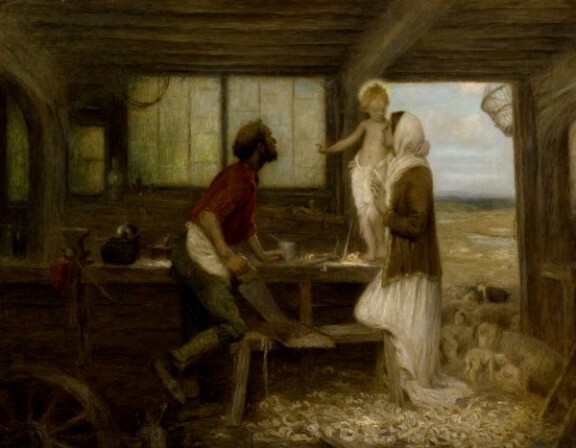 Paintings of the Holy Family often show some object that is a presentiment of Jesus’ horrible death: a little wooden cross, some carelessly placed nails, etc. Raphael has, thank goodness, ignored this tradition. Here Mary plays happily with her chubby little son, both seeminly unaware of the future. Some commentators suggests that the veil Mary dangles over Jesus is a reference to the shroud that would one day cover his body. Let us hope they are wrong, and that Mary is merely playing with her little son as any mother would. Raphael, like all Renaissance artists, ignored historical accuracy: his Mary is more high-born Italian noblewoman than Jewish peasant girl. 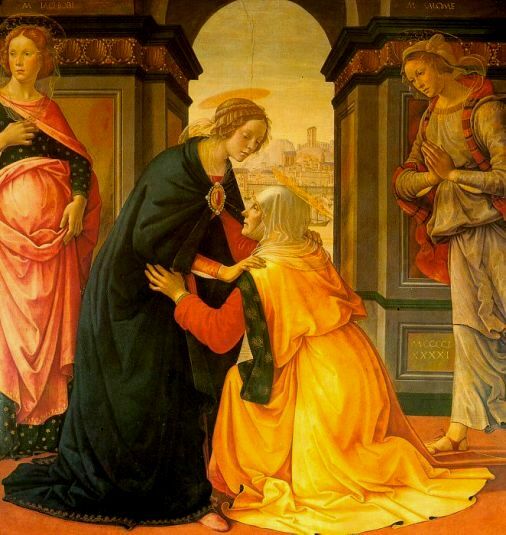 The real Mary could only have dreamed of the clothes and jewels this Mary wears. 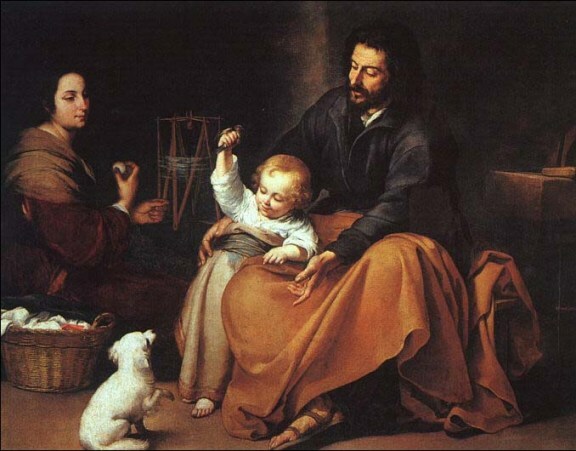 Murillo’s Holy Family looks and acts like a normal family. Mary is spinning, Joseph’s workshop is nearby (at right), and this family has pets they play with. Jesus is blond, an historical impossibility – but then this is a Spanish painting, and blond-haired children were rare and prized in medieval Spain. The little bird is a goldfinch, a symbol of Christ’s Passion, since goldfinchs eat thistles and thorns like the ones used in the Crown of Thorns. Murillo’s Joseph is strong, young and in control, refuting paintings that showed him as an old man unlikely to have a sexual relationship with his wife Mary. Mary works quietly in the background, the ideal wife! 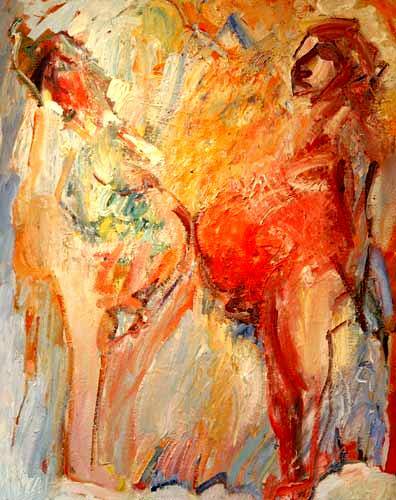 Both parents are focussed on Jesus – as we should be, the artist implies. 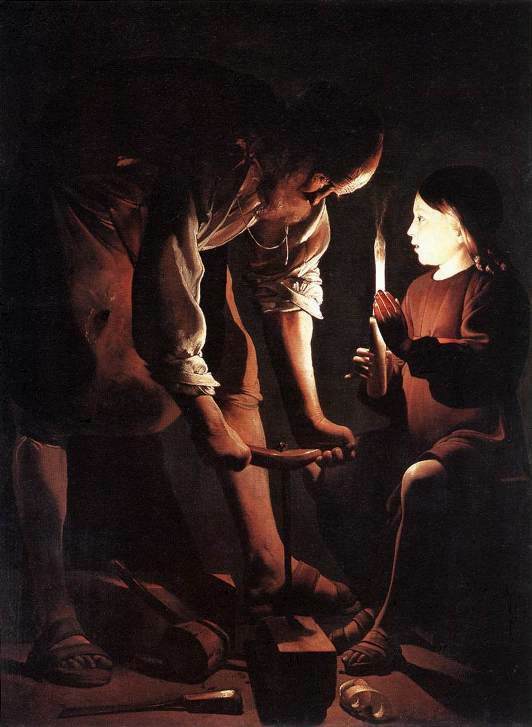 George de la Tour specialized in light/shadow (chiaroscuro) paintings, using indirect lighting to throw the subject into simple, almost giometric shapes. The effect is calming, meditative. Here Jesus holds a taper to illuminate the work Joseph is doing, but more light seems to come from his own face than from the taper. Though still a little boy, Jesus is already the Light of the World. Many paintings of Joseph and Jesus have some object that makes reference to the future Passion of Jesus. 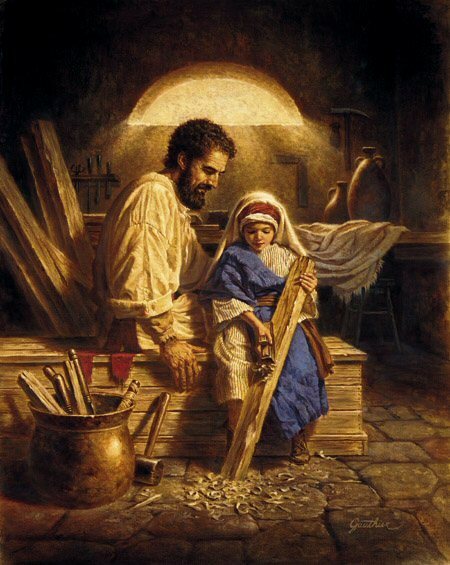 The piece of wood that Jesus holds may be a reference to the cross-beam he will later carry to Calvary, but it may also be just a piece of wood he is learning to plane. His father Joseph watches him fondly, ready to lend a gnarled hand should the child need help. Gauthier’s painting has a lovely serenity not often seen in representations of this scene.